Despite the headline, I haven’t written a Meatloaf-inspired ballad, or penned a gushing poem on the psychology of domestic abuse. Far more prosaically, I have a new bike. For the bike nerds, it’s a Kona Dew 2012 hybrid, with Shimano shifters and chainset. For the rest of us, it’s a comfortable-ish type you can use for commuting and on well-maintained trails, with enough gears to prevent too much huffing and puffing. Aside from a few years of ambling around uni campus on my metallic purple Raleigh Princess bike, I’ve never been much of a cyclist. Too many hills and scary drivers – and that’s before we consider the dreaded helmet-hair. Luckily, in Toronto there are hardly any hills but there are plenty of side roads in which to avoid horrid lorries and major traffic – and the frizz-inducing humidity in summer makes helmet-hair a bit of an irrelevance. 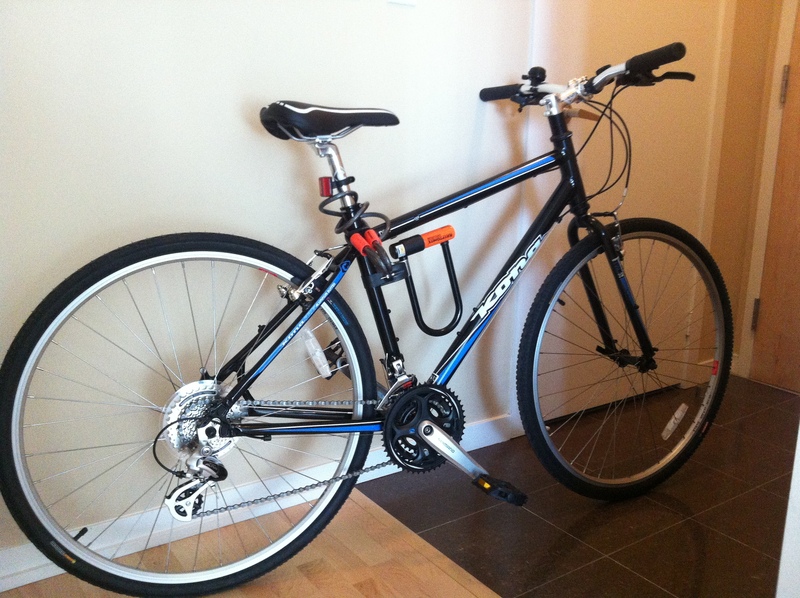 My latest purchase was also inspired by hiring a bike for the day and taking it on a fantastic, sunny, ride along the waterfront. It was one of those hearty weekend afternoons that has you plotting a new lifestyle of 6am runs, vegan stir fries and lunchtime pilates, before you go home, forget about all that nonsense and watch TOWIE with a Chinese takeaway and glass of wine. 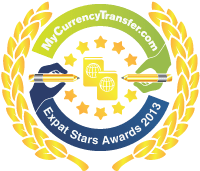 (TOWIE, for Canadians who haven’t come across this Bafta award-winning series – truly the jewel in British broadcasting’s crown – is like The Real Housewives of Vancouver, but with less tennis and more vajazzling). 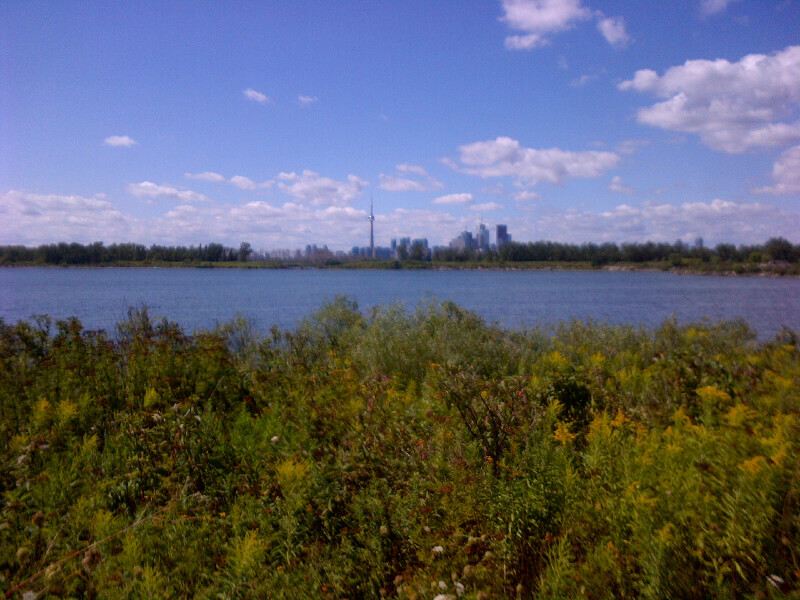 For the most part, my cycle ride followed the Martin Goodman trail east from downtown, for around 26 kilometres, taking in the peaceful Tommy Thompson Park nature reserve and the full length of the beaches. 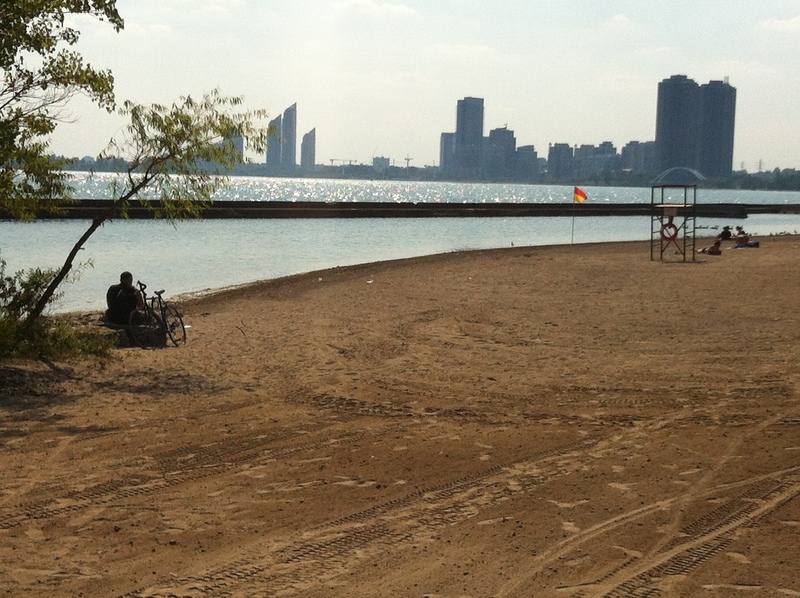 On the way back, we cheated by skipping Tommy Thompson, though we did meander through Ashbridge’s Bay Park for a while. I’ve created an interactive map, plotting our journey with pictures, here (requires sound, start on the green marker then click each marker in turn for the info and pictures). You should be able to add details to the map too, should you know of any points of interest or useful info that I’ve missed out. Despite my enjoyment that day, after buying my own bike from the very helpful Duke’s Cycle on Queen St West, I realized a slight snag in my plan to become the female Bradley Wiggins; I was terrified of going out on my own. But I’m an inpatient soul and after studying a cycle map for several hours, my terror of venturing out alone was finally superseded by a desperation to get out into the sunshine and check out my new ride. As I’m still a scaredy-cat when it comes to roads, I decided to test the other side of the waterfront trail, heading west towards Etobicoke. The sites along the way were a mixture of industrial developments, harbours, outdoor patios, shaded parklands, splash pads and sandy beaches. 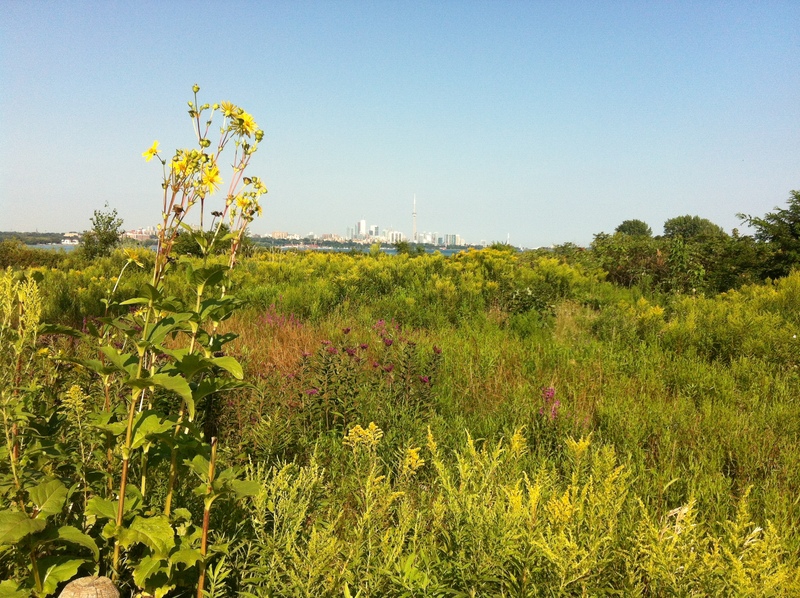 Humber Bay Park, with its butterfly sanctuary and clumps of colourful wildflowers, made for a secluded detour, away from the aggressive commuters that were starting to erode the tranquility of the main trail. I thought about reminding them of the 20km/hr speed limit, but on reflection decided maybe that wouldn’t be cool. 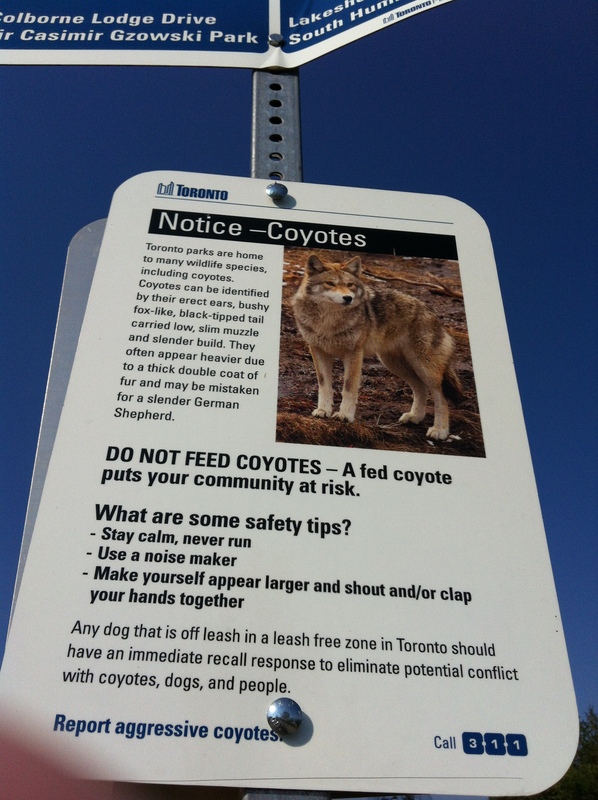 I was also intrigued by a warning notice to dog-owners about Coyotes. Not sure how common these are but I wouldn’t want to run into one in the dark. Wild animals and maniacal two-wheelers aside, I’m now impossibly hooked on cycling and can’t wait to explore some of the ravines dotting the city. At some point, I’ll even venture onto the roads. This is a helpful website that helps cyclists to plan the safest route through the mean streets of Toronto. And I definitely want to check out some of the recommendations here, too. Any other personal faves/under-rated sites or routes you’d like to share? Or perhaps just some friendly cyclist-to-cyclist advice on how to shift gear without your pedals crunching arthritically in a “please don’t do that to me” sort of way? Please add your tips underneath this post!